MIAMI, Florida (November, 2016) - Presagia has officially launched a new website, providing visitors with an enhanced user experience to easily find information about its workforce absence and disability management solutions as well as useful resources on industry best-practices. 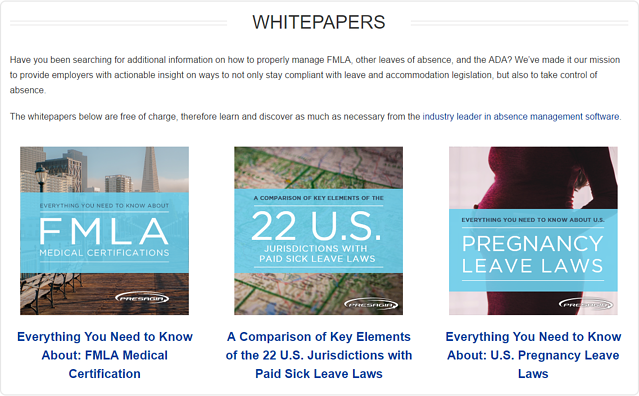 The revamped website includes in-depth details about the features of Presagia Leave and Presagia ADA, cloud-based solutions that help employers tackle employee absence and compliance with the FMLA, the ADA and more than 450 state and municipal leave rules. It also gives the website a modern look that guides visitors to the information they want and includes clear calls to action throughout.